Mankind is capable of an awareness that is outside the range of everyday life. My monumental sculptures are created to communicate with that awareness in a way similar to classical music. Just as most symphonies are not intended to be descriptive, so these works do not represent figures or objects. I think the work of art look like a stone with a hole in it, considered in folklore and magic to sometimes be able to grant a glimpse into other worlds. Holey stones are often also called fairy stones. Philip Permutt in his book Sacred Stones and Crystals, says: "It is said that, with practice, when you look through the hole, you can see the fairie folk. This is probably an old legend to explain second sight or clairvoyance." One of the most famous holey stones is Men an Tol, in Cornwall, which the Jubilee Oracle also reminds me of. That ancient megalith is associated with healing and at one time children with rickets were passed naked through the hole nine times in the hope of a cure. 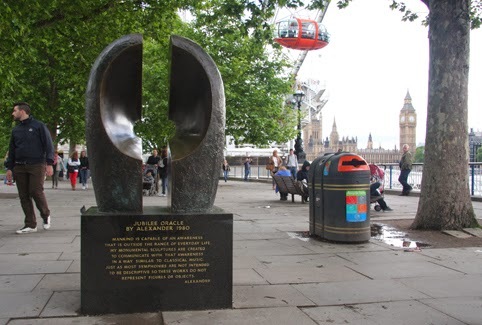 The Jubilee Oracle is on a very busy part of the Thames riverbank near the London Eye, so I am not sure you would often get the peace and quiet necessary to use the statue for scrying, but perhaps in the early morning it might be possible to see if it could be used to find the awareness mentioned in the inscription on the plinth.